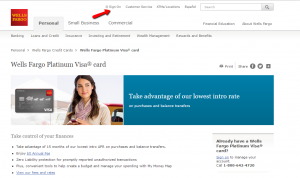 Another card issued by Wells Fargo Bank, the Wells Fargo Platinum Visa Card provides you a 0% introductory APR for the first 15 months after opening your account and many other benefits, including a user-friendly online system where you can manage your account and make payments. Below, we will teach you how to log in, recover your credentials and create a new account. Step 1: Open the card’s homepage and press the ‘Sign-on’ link to open the login page. Step 2: In the newly opened window enter your username and password in the required spaces and select what part of the system you would like to get access to (account summary, transfer, bill pay, brokerage or trade). Then press the ‘Sign on’ button. Step 1: Open the credit card’s login page and click on the ‘Username/Password Help’ button. Choose from the three available options: forgot your password, username or both. 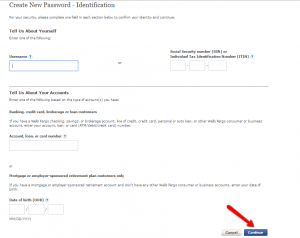 Step 3 (Username): In case you selected the ‘Find username’ option, introduce your Social Security Number/Individual Tax Identification Number and Password and press ‘Continue’. 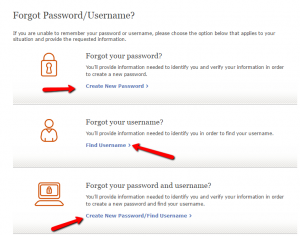 Step 3 (Username and Password): If you forgot both your username and password you should introduce your Social Security Number/Individual Tax Identification Number and your account, loan or card number. Then click on the ‘Continue’ button. Step 1: In the login page click on the ‘Sign Up Now’ button. Q: What does Platinum stand for in the name of the credit card? A lot of credit cards have the word Platinum in their name, and that it is not meaningless. It means that a Platinum card can be used anywhere that takes plastic and it is the card for someone with good or excellent credit, since the Platinum cards will not be approved to someone with bad credit standing. Also, most Visa Platinum cards do not charge annual fees. 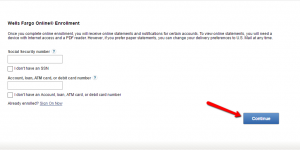 Q: What payment options exist with the Wells Fargo Platinum Visa Card? The payments can be made in a few ways. One of them is online with your deposit account through Wells Fargo Online as one-time or automatic payments. Another one is by mail in terms of checks or money orders. You can pay it over the phone with a deposit account or through a teller at a Wells Fargo bank. Some other options are Western Union Quick Collect, Bank wire transfers and MoneyGram. Q: What should I do in case I notice the unauthorized charges on my card? Free of charge Zero Liability is the included service in your Wells Fargo credit card and if your card or its number is lost or stolen and you are not responsible those charges, you must report them as soon as possible by calling customer service at 1-800-642-4720. The card will then be blocked and no further charges will be allowed.